Butler Studio has been trusted to bring "Art to your Beautiful Life" for over 17 years, but Master Photographer, Scott Butler, is bringing in a new level of artistry with custom hand painted oil portraits. Why settle for ordinary family portraits? You can have fine art that expresses your family's personal style, decorates your home with impeccable taste, and also will be a priceless family heirloom for generations to come! 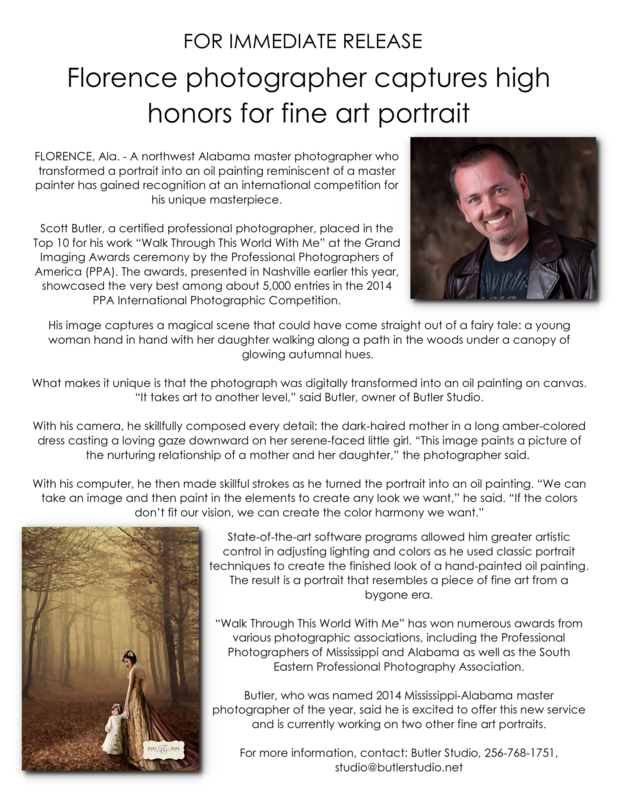 Scott Butler has won one of the HIGHEST AWARDS a photographer can achieve with his Fine Art Paintings. His Portrait, "Walk Through This World with Me," received a Top 10 award for Portraits in all the WORLD by PPA (Professional Photographers of America). Butler Studio's Fine Art Paintings are perfect for your family whether your style is formal or fun, dramatic or casual. Let them create your heirloom portrait for each stage of your life - from marriage, to children, to graduation, and more! Most artists start at $6000 or more for a custom likeness, but because custom paintings should not only be for the super rich, Scott's custom, hand-painted portraits start at only $2000. Contact Butler Studio to commission Scott Butler for your custom artwork today. Butler Studio will walk you through every step of the way, from the design consultation, to the final hanging of your new masterpiece!